Hyundai's autonomous truck Xcient makes a 40-kilometer trip on highway. August. 23, 2018 07:35. by Hyoun-Soo Kim kimhs@donga.com. Hyundai Glovis, a logistics company affiliated with Hyundai Kia Automotive Group, has its logistical center for automobile parts in Asan, South Chungcheong Province. On Tuesday, the Asan KD Business Center was loading onto containers autoparts to be exported to China. Soon, a 40-ton truck showed up, dragging a trailer. After the containers were loaded onto the trailer, the driver got on the Yeongdong Express Highway via an interchange past the Uiwang Inland Container Depot. That was where the day’s highway autonomous driving test started. The driver took his hands off the steering wheel right after pushing the auto pilot button on. The trailer drove itself as the driver had snacks, watched the views outside the window and drank tea along the 40-kilometer auto pilot section that led to Incheon Port. He laid his hands back on the steering wheel only when the vehicle was running past an interchange or a toll gate. The drive marked the first success in Korea of an auto pilot test driving of a large truck hauling a trailer. The Ministry of Land, Infrastructure and Transport issued a temporary license for the test drive of the truck in late June. 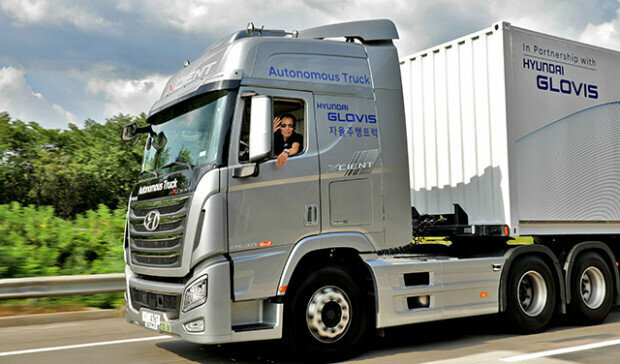 A Hyundai official said that the autonomous driving demonstration was conducted with a 40-ton Hyundai Xcient truck connected with a trailer equipped with Level 3 autonomy on the U.S. Society of Automation Engineers (SAE) standard. “It is possible that the autonomous technology will be in commercial use by 2020 or after when relevant infrastructure or laws are available,” the official said. Under the SAE standard, Level 3 is a step before a completely autonomous driving and refers to conditional automation in which the drivers has to intervene in certain conditions posing danger. Hyundai expects to reach Level 4 soon, a level of high automation in which no driver attention is ever required for safety. A large truck connected with a trailer is about 3.5 times longer, 1.4 times wider and 9.2 times heavier (when unloaded) than an ordinary compact sedan, requiring a far more advanced and precise autonomous driving control system. Hyundai said it installed 10 sensors on the truck to ensure the surrounding environment is fully recognized. Autonomous driving of large trucks is considered one of key future technologies that global automakers such as Toyota and Daimler-Benz and information technology giants including Google are paying attention to, as the technology can bring about epochal innovation in cargo transportation and logistics. More than anything else, the technology is expected to significantly reduce traffic accidents caused by truck drivers’ overwork or drowsiness behind the wheels. The technology would also make it possible that self-driving trucks perform group driving that is expected to revolutionize the logistics industry. Hyundai aims to develop the group driving technology for large trucks after 2020.